The dig first provides you with some very useful information - click 'next' to proceed through the pages. Next an aerial view of Middlewich will be displayed - look for potential dig sites by moving mouse pointer over the scene. The Mouse pointer changes to a pointed index finger when it is over an area of interest - click on this area to zoom in. Each click zooms in closer and when zoomed right in you may be lucky enough to make a 'find' and an information panel about the 'find' will pop up. 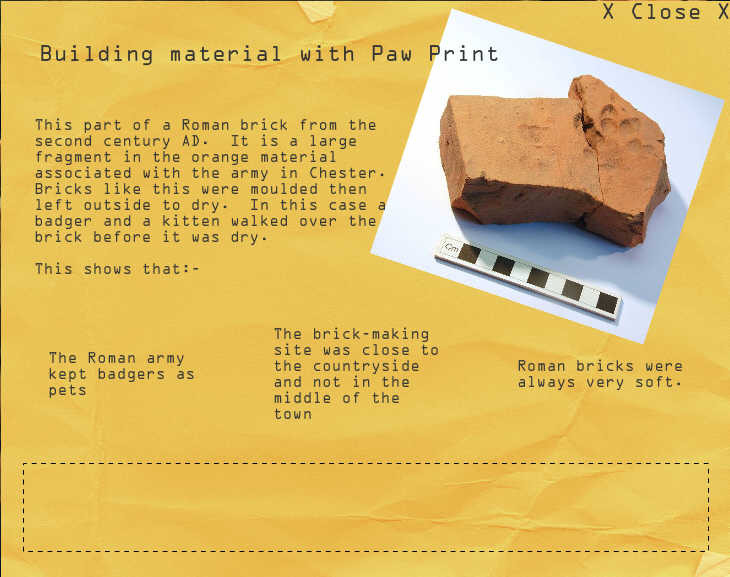 The find information panel will also contain 3 sentences about what the find means but are they correct? - Click on the information and the answer will be given in the panel below. Click 'X CLOSE X' to exit the information panel and carry on digging. Click 'Finish' at the bottom right corner of the aerial view when you have finished your dig.